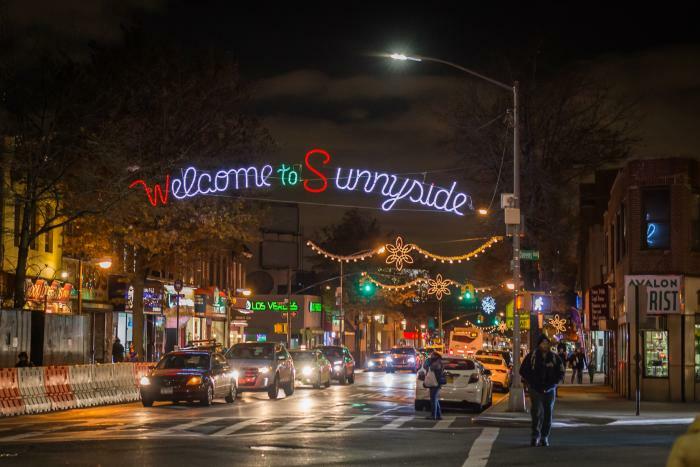 The Sunnyside Shines Business Improvement District, in collaboration with Queens Night Market, is launching a new outdoor holiday shopping market in the heart of Sunnyside this holiday season. The Holiday Market will take place in Bliss Plaza at 46th Street and Queens Boulevard (under the elevated 7-train) and be held every Saturday and Sunday (12-6 p.m.) from November 24th through December 16th. The Bliss Plaza Holiday Market will include over 30 rotating vendors each day, including local businesses, entrepreneurs, and craftspeople offering gift items ranging from 3-D printed jewelry, photography, fine ceramics, artisanal candles, handmade swaddlers and other baby gifts, popular food vendors selling Burmese palatas, Romanian-Hungarian chimney cakes, empanadas, and much more. The concrete viaduct above Bliss Plaza provides shelter from the elements, and Sunnyside Shines is providing patio heaters to make the market even more welcoming and comfortable for vendors and shoppers. The Holiday Market is part of Sunnyside Shines’ district holiday programming, which will also include a holiday shopping ‘passport’ full of coupons to neighborhood businesses, and a free trolley bus on November 24th and December 8th to transport visitors around Sunnyside. The trolley bus route will include a stop at Big Six Towers in neighboring Woodside, allowing nearly 1,000 families living in the complex easy access to the Holiday Market and Sunnyside’s holiday shopping and dining scene. Applications for the Bliss Plaza Holiday Market are being accepted on a rolling basis; the online application can be accessed at: http://bit.ly/2018-Bliss-Holiday-Market. Details on participating vendors will be added as the roster is finalized at: http://www.sunnysideshines.org/blissplazaholidaymarket. No user commented in " Sunnyside Holiday Night Market "